We loved our stay at Ebusus apartments; it was wonderfully central, our balcony had great views and our hosts were friendly and welcoming. There was good wardrobe and drawer space. Good size bed. Good bathroom with regular changing of towels. Small but adequate kitchen with all that was needed. Good dining room table/chairs. The balcony was spacious with excellent views. Good cleaning service. 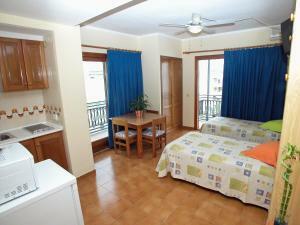 Basic but spacious studio off a quiet street but very short walk to restaurants and the beach. 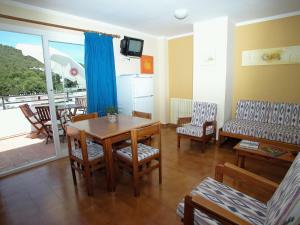 Well equipped kitchen, comfortable bed and nice shower for the cost. The location is excellent! Bus stop, shops, restaurants, lovely walks along the river and the beach are all there within a few minutes. The staff are friendly and helpful. The apartment was cozy, quiet and relaxing. Everything was good-large room, very comfortable bed, light, two balcony, very good location and all facilities you need for eat and drink in the studio. The receptionist was really friendly and advise us good! In the center of the city. Enough space in the room, good bed, clean. Personally, I consider Santa Eulalia a better place to stay compared to Ibiza city when visiting the island. The apartment is right at the center of the small town, all facilities including bus station, restaurants, supermarkets are just few steps away. The sea beach of Santa Eulalia could be seen from my balcony. Apart from its great location, the apartment is well-equipped with all amenities that a backpacker might need on a few days or even a longer trip, especially those who come to enjoy countless natural and cultural (with music on the top of the list, of course) treasures on the island. We like the fact that Apartamentos Ebusus are close to everything: to the cafe and restaurant area, to the shops, to supermarkets, to the main square, to the sea and the beaches; to the bus station, from which you can go anywhere on the island (and the airport); to the harbour, from which one can go to Formentera and other places. Our attic flat had everyhting: kettle, ironing board, capacious fridge with ice and chilled water, salt and pepper, washing-up liquid... The Wi-Fi connection worked perfectly. The balcony was fabulous, with table, chairs, sunbeds (and a washline) and a stunning view. The managers also kept our luggage in storage on the last day of our stay, after we vacated the flat. First of all, Apartamentos Ebusus is in Carrer San Vicent, dead bang in the middle of everything: close to the restaurants and cafes, to the main square, to the sea and the beaches, to the bus station, from which one can go anywhere on the island (airport included), and to the harbour, from which one can travel to Formentera and other places on the island. I liked the fact that in our attic apartment there was just about everything: kettle, ironing board, hair-dryer, capacious fridge, plenty of wardrobe space, a beautiful balcony equipped with table, chairs and sunbeds. In the kitchen we found chilled water, ice, washing-up liquid, salt and other essentials. Upon arrival, each of us was given a free bottle of chilled water. The Wi-Fi connection was excellent. The lift worked superbly. There were good supermarkets nearby. I don't think we could have find anywhere better. Lock in a great price for Apartamentos Ebusus – rated 8.9 by recent guests! Located just 650 feet from the beach, these cheerful apartments are located on a street with many restaurants. Each one comes with a private balcony. 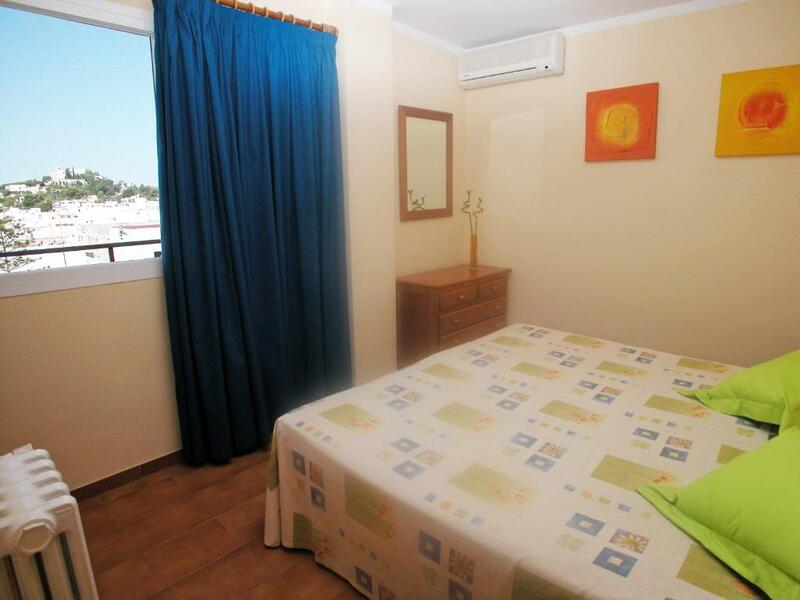 The studios and apartments at Apartamentos Ebusus feature flat-screen satellite TV and a bathroom with a hairdryer. Each one comes with a kitchen with a microwave and toaster. They also feature either air conditioning or a ceiling fan. Take the pleasant, 5-minute stroll down to Santa Eulalia’s white sand beach and enjoy a refreshing swim in the Mediterranean. Choose between tasteful penthouses, compact apartments and cozy studios which have all been tastefully decorated. The Ebusus offers a cleaning service and change of towels every 2 days. There is also a change of bed linen every 4 days. The property provides laptop safety boxes and there are also laptops available for hire at reception. This is our guests' favorite part of Santa Eularia des Riu, according to independent reviews. 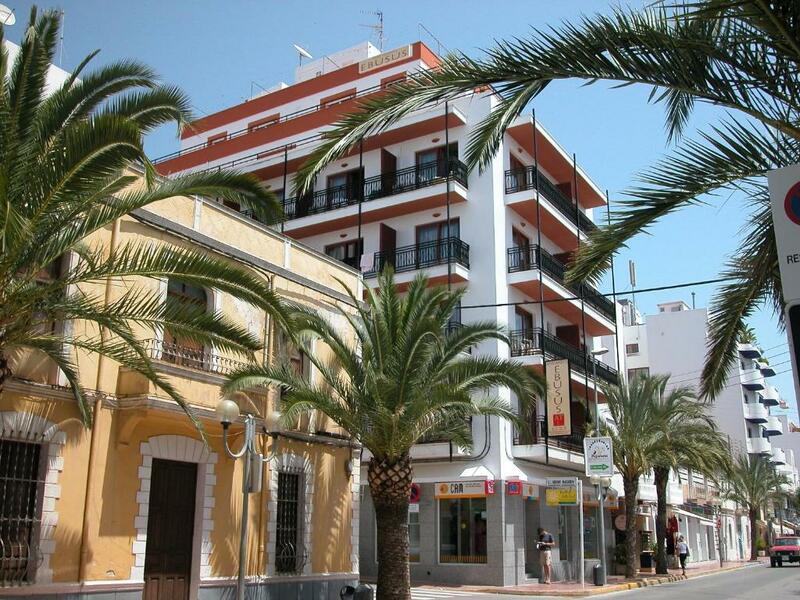 This property is also rated for the best value in Santa Eularia des Riu! Guests are getting more for their money when compared to other properties in this city. 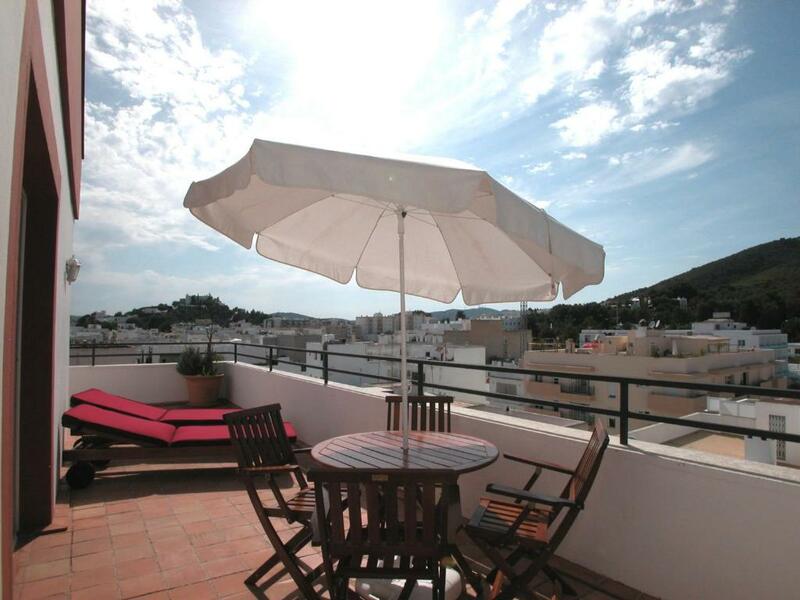 뀐 Located in the top-rated area in Santa Eularia des Riu, this property has an excellent location score of 9.2! When would you like to stay at Apartamentos Ebusus? This air-conditioned apartment is located on the fifth or sixth floors. It features a bedroom with 2 single beds which can be joined together with a double sheet. There is a living room with sofa bed which can be split into 2 single beds, a kitchenette and a large terrace with a table, chairs, loungers and great views of Santa Eulalia. The bathroom has a bath and shower. There is a cleaning service and change of towels every 2 days and a change of bedding every 4 days, or upon request. Each apartment comes with a ceiling fan and a free safe. Laptops are available to rent from reception. This apartment has a double or twin bedroom with a ceiling fan, a kitchenette in the living room and a balcony. Ideal for families with children, or groups of friends with a maximum of 4. The fourth guest, if a child under 12 years, has no additional cost. There are 2 beds in the bedroom which can be joined together with a double sheet upon request. There is a sofa bed which converts into 2 separate beds in the living room. The kitchen is fully equipped and great for those who wish to prepare meals during their stay. 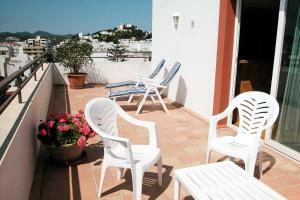 The balcony comes with one small table and 2 chairs for your sunbathing or outdoor dining. The complete bathroom has bathtub and shower unit. There is a cleaning service and change of towels every 2 days and change of bedding every 4 days, or upon request. There is an electronic safe with capacity for a laptop computer so you can bring your own laptop and it will be secure. You can rent laptops for hours from the reception. 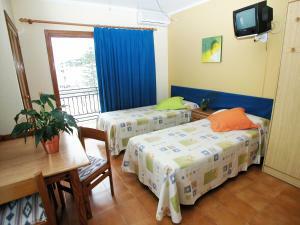 These air-conditioned studios feature 1 double or 2 single beds, a kitchenette, bathroom and one or 2 furnished balconies. Each studio comes with a ceiling fan and a free safe. Laptops are available to rent from reception. Children under 12 stay for free in an extra bed. These cheerful apartments are located on a road line with palm trees and are just 200 m from the beach. You can soak up the sunshine on the private balconies. 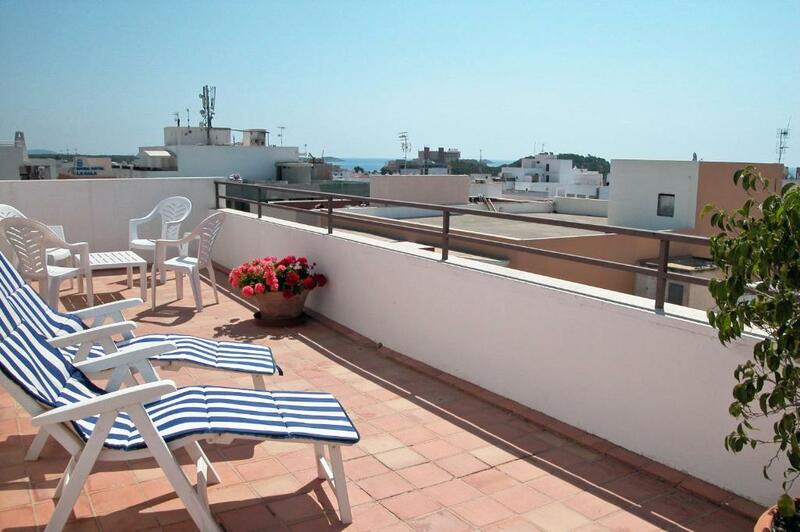 Enjoy your holiday in Santa Eulalia at your pace this holiday with the Ebusus' well equipped apartments. You can cook up a feast if you are adventurous in the kitchen and then dine in true Ibiza style on your private balcony. Interiors are adequately furnished and boast either ceiling fans or air conditioning. Take the pleasant, 5-minute stroll down to Santa Eulalia’s white sand beach and enjoy a refreshing swim in the Mediterranean. Choose between tasteful penthouses, compact apartments and cosy studios which have all been tastefully decorated. There is a cleaning service and change of towels every 2 days and a change of bedding every 4 days, or upon request. There is an electronic safe with capacity for a laptop computer so you can bring your own laptop and it will be secure. You can rent laptops for hours from the reception. House Rules Apartamentos Ebusus takes special requests – add in the next step! Apartamentos Ebusus accepts these cards and reserves the right to temporarily hold an amount prior to arrival. If you expect to arrive after 21:00, please inform Apartamentos Ebusus in advance. If you require extra beds, please inform Apartamentos Ebusus in advance. Please inform Apartamentos Ebusus of your expected arrival time in advance. You can use the Special Requests box when booking, or contact the property directly using the contact details in your confirmation. The room had extraordinary views across the town. I couldn’t work out how to set the heating. The curtain rail came off when I tried to open the curtain. There is nothing negative to say. We definitely would come back! I think the walls are very thin as you can easily hear your neighbours so it’s a bit noisy (I could hear my neighbour sneezing like he was standing next to me). The floor was not clean making difficult to use room without your own sleepers. They need to properly clean the tile floors as part of the routine. Nothing really. Perhaps the fact that the reception is not always open, but the managers/owners are within easy reach by phone, and on arrival each of us was offered a free (and welcome) bottle of chilled water. Nothing, excpet, perhaps, the fact that the managers/owners weren't always there. However, they were within reach by phone: we arrived late in the evening and after a short wait the manager came and took excellent care of us. He even gave each of us a (much welcome) free bottle of chilled mineral water. Excellent location, very good hosts. Perfectly cleaned. There is quite a large library. A children's bed and chair are provided. Good sound insulation.